Lt. Gov. 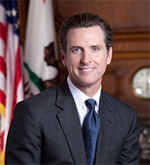 Gavin Newsom has just been confirmed to speak during the closing session at the Mobility 21 Summit! Throughout his career, Newsom has been a strong advocate for transportation infrastructure investment. Come hear about his economic development plan and how infrastructure plays a role. You won’t want to miss it! Newsom joins California Assembly Transportation Committee Chairwoman Bonnie Lowenthal and Vice Chairman Eric Linder, and California Secretary of Transportation Brian P. Kelly as featured speakers at this year’s Summit. Click here to view the entire speaker lineup. Mobility 21, founded in Los Angeles County, has since grown to represent all seven Southern California counties. From Ventura County in the north, to Imperial and San Diego counties in the south, we all have a common goal of improving transportation for the 21 million people who call this region home. This coming Tuesday, over 1,000 transportation professionals, elected officials and business leaders will converge upon the JW Marriott at L.A. Live for the largest one-day transportation event in the state. 1. Don’t miss the closing session. It pays to stay the whole day. Enter the raffle drawing for a chance to win a prize during the closing session, but you must be present to win. Prizes include: flatscreen TV, iPod Nano, Lenovo IdeaTab, Tiffany & Co. bracelet, and more! 2. Don’t forget your parking pass. Complimentary self-parking is available for all Summit attendees in L.A. Live West Garage Lot W – Gate G. But don’t forget to print your parking pass to give to the parking attendant when you arrive. 3. Bring your registration print out and TAP card. Taking Metrolink to the Summit? Your registration print out will serve as complimentary Metrolink fare media. Don’t forget your custom Metro TAP card to use transit between Union Station and the conference venue. Visit the Mobility 21 website for transit directions. 4. 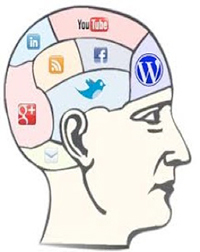 Put your thinking cap on. Figure out the clues from this year’s Summit Expo Scavenger Hunt to get your passport stamped at the corresponding booths for a chance to win a Scott Speedster road bike at the closing session. Must be present to win! 5. Fully charge your smart phone. For the first time, the Mobility 21 Summit has gone mobile! Check out www.mobility21.com from your smart phone to view the Summit app with speaker bios, session feedback surveys, conference attendees, sponsor information and more! Live tweeting from the event? Please use #Mobility21 to track the conversation. Check out these tips for making the most of the networking breaks at the Summit. The number one tip: always introduce yourself when you say hello to casual acquaintances and officials. Of course you’re a superstar, but not everyone has a great memory for names. As a leading Southern California based community outreach firm, MBI Media is constantly looking towards new strategies for public engagement and education. The use of social media platforms has proven to be one of the major tools on the forefront of modern communication, and MBI has discovered that developing a social media strategy for community outreach and public relations has become imperative for a successful program. From Oct. 26 – 29, the Construction Management Association of America will be hosting their 2013 National Conference and Trade Show in Las Vegas, Nev. MBI’s President and CEO, Mary McCormick, will be presenting alongside Transportation Corridor Agencies, Los Angeles County Metropolitan Transportation Authorty and ARCADIS on the unique advantages that social media can bring to a community outreach program specifically for construction management projects. McCormick, who serves on the Construction Management Association of America’s (CMAA) Board of Directors as the Communications and Social Media Chair, will be discussing how to implement social media platforms into marketing and outreach plans for agencies, small businesses and large corporations. Reaching out to diverse audiences, simplifying complex messages and providing examples of social media in action are a few topics that will be explored. MBI Media understands the importance of staying current with the rapidly evolving methods of communication and remains committed to providing cutting edge outreach and education to each and every project it takes on. Growing a successful organization takes more than attending meetings and crunching numbers, especially in today’s business environment. 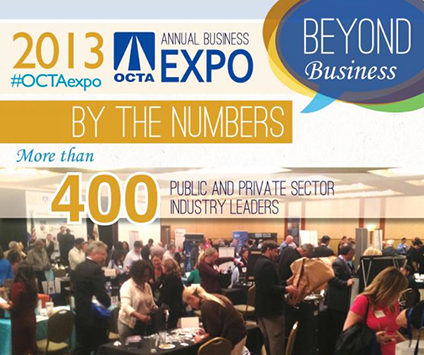 That’s why the Orange County Transportation Authority (OCTA) hosted more than 400 business leaders in the public and private sector Wednesday, Oct. 10 at the DoubleTree Hotel in Orange for its 2013 Annual Business Expo, a day of networking, cultivating relationships and building partnerships. As one of the fastest growing industry segments, small and diverse business enterprises highlight the changing landscape of Orange County commerce. Johnson presented OCTA’s first Business Community Leader award to recognize an individual who demonstrates “outstanding leadership and support” to advance business in Orange County. Selected by a committee of representatives from OCTA, Disneyland Resorts and the U.S. Small Business Administration, Kim-Yen Huynh received a plaque commending her efforts over the past five years to help people in diverse communities become familiar with transportation projects. In 2012, OCTA issued more than 2,500 contracts for goods and services to the private sector, and more than 20 percent of those were awarded to small and diverse businesses. That totaled to $20 million last year in contracts to small and diverse businesses. However, OCTA also understands that these businesses may face challenges when working with the public sector, particularly if it is their first time, OCTA Chairman Greg Winterbottom shared. “Our goal today is to help you understand how we work, to introduce you to others in both the public and private sector, and to forge relationships that will benefit all of us in the long run,” he said. The half-day exhibition of more than 50 organizations, including Southern California Edison, the Port of Long Beach, the California Department of Transportation and Metrolink, provided an opportunity for vendors to find information on how to best do business with public agencies. Hundreds of participants moved from table to table, speaking with representatives and making the face-to-face connections that are critical in building strong business relationships. AECOM is one of the world’s leading professional technical and management support services firms. We provide a blend of global reach, local knowledge, innovation and technical excellence in delivering solutions that create, enhance and sustain the world’s built, natural and social environments. However, we strongly believe that it is our partnership with and connection to our local communities that allows us to remain a leader in all of the key markets that we serve. That is why we are proud to once again sponsor the Mobility 21 Summit and highlight all of the great work that is being done throughout the region. AECOM has been headquartered in Los Angeles for over 60 years, and has helped design and build thousands of projects throughout Southern California. In fact, AECOM has been supporting the development of the Los Angeles transit system since 1958, when the firm was selected by the Los Angeles Metropolitan Transit Authority to study alternative transit systems. Since then we have provided engineering management consulting services for the development of the Red Line subway and the Blue Line and Green Line LRT lines from 1982 through 2002, and are currently at work on the Regional Connector, Exposition LRT Phase 2 and Gold Line Eastside Extension Phase 2 projects. We are proud to be able to state that we have performed work on every Metro Rail and Metrolink transit line in Los Angeles. As part of the fabric of Los Angeles we look forward to continuing to partner with Mobility 21 to help the region grow and prosper. AECOM is helping to bring the benefits of modern mass transit to Los Angeles through its work on the Regional Connector Transit Corridor, a two-mile transit link between the Metro Gold line, Metro Blue line and Expo light rail transit (LRT) systems throughout downtown Los Angeles. The firm, in joint venture, is providing advanced conceptual engineering during phase 1 and preliminary engineering for phase 2, including preparation of technical documents to support the draft and final environmental impact statement and environmental impact report. When completed, the three-station, 1.6-mile tunnel alignment will create a 50-mile north-south LRT line from Pasadena to Long Beach and a 16-mile east-west LRT line from East Los Angeles to Culver City. The project will reduce one-way light rail trips by 10-20 minutes and provide access to downtown and regional destinations for more than 90,000 passengers daily. For the second year in a row Ethisphere has named AECOM as one of the World’s Most Ethical Companies. The designation recognizes firms based on their commitment to ethical leadership, compliance practices and corporate social responsibility. Guided by our Core Values, AECOM is committed to delivering innovative, sustainable solutions to address environmental challenges; keeping our people, clients and partners safe in all of our activities; contributing time and funds to support important causes throughout our communities; and, above all, serving our clients with the highest ethical standards. We are honored to receive this honor for the second-straight year and we are committed to conducting business in an ethical manner – with our dedication to integrity driving our daily activities around the world. On Oct. 10, the San Bernardino Associated Governments (SANBAG) Board of Directors held a workshop to hear findings from recent studies on Express Lane issues including equity, traffic and revenue, financial feasibility and public outreach. The purpose of the workshop was to provide an overview of the study results and answer questions by members of the Board as they deliberate on including Express Lanes as an alternative for study in the Environmental Phase for future Interstate 10 and Interstate 15 improvements. The Express Lane alternative was introduced in response to three major factors facing San Bernardino County: (1) increasing traffic demand, primarily due to future population growth; (2) limited right of way availability; and, (3) declining transportation funding opportunities from the state and federal government. The project team showed that Express Lanes are a sustainable mobility option, provide future revenues for ongoing improvements and offer motorists a choice for a more reliable commute time when they need it. The SANBAG Board of Directors will be asked to incorporate information from these studies to make a determination if Express Lanes should be considered as an alternative through completion of the environmental review at the meeting in December. Your opinion matters. If you want to learn more and/or comment on the projects, visit www.i10corridorproject.org. The Alternative Clean Transportation (ACT) Expo is North America’s largest alternative fuels and advanced clean vehicles conference and expo—representing electric, hybrid, hydrogen, natural gas, propane autogas and renewable fuels. Now in its fourth year, ACT Expo is the industry’s largest annual gathering, bringing together more than 3,000 attendees—fleets, technology companies, original equipment manufacturers, fuel providers, infrastructure developers and policymakers—for an in-depth discussion on the rapidly evolving clean transportation industry.